The MC3190 Rugged Windows CE Barcode Kit enables mobile workers to collect data in a batch mode as well as in real time bringing anytime mobility to your mobile applications inside the four-walls. 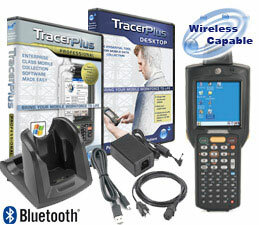 Pairing TracerPlus data collection software along with the rugged and ergonomic MC3190 barcode terminal, retailers, government agencies and distribution centers can streamline and error-proof business processes, improving employee productivity as well as customer service and satisfaction. Using Symbol's successful MC3000 series as a base for development, the MC3190 introduces many new capabilities driving affordability, ease-of-use, ease-of-management, flexibility, and brings the overall life-cycle and system performance to new heights.